Wondering about which classes or professors you want to take next semester? Want info on getting involved in research or participating in the Psych Honors Program? 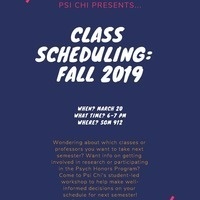 Come to Psi Chi's student-led workshop to help make well-informed decisions on your schedule for next semester!